Honey bee drone in flight. Before take-off a drone cleans its antennae and eyes. This often occurs at the nest entrance. After take-off drones produce characteristic sound which is different from sound produced by flying workers. Drones perform flights not only from the nest but also from swarm cluster . Drones fly only during favourable weather conditions, when air temperature is higher than 19 °C . It was suggested that drones do not fly when the temperature exceeds 38 °C . Activity of drones is reduced when wind speed exceeds 4-6 m/s . Drones fly 10 - 40 m above ground; the flight height is lower during windy weather . Drones of different subspecies can fly at different heights . Peak of drone flight activity occurs between 14:00 and 16:30  but see  and it depends on weather conditions . In higher temperature flights start later  and they are longer . Time of day when the drones perform flights differs between some species of the genus Apis  but see . This can be important for isolation of species. Differences in this respect between subspecies of Apis mellifera are smaller . Solar time  should be used in future research in order for easier comparisons between studies. The first flights made by a drone are called orientation flights. Drones start flying at age 8.28±1.74 days . Drones from strain selected for higher pollen collection start flying ate earlier age . The orientation flights last 1 - 6 minutes . It was suggested that the purpose of the short flights is orientation , during those flight drones also defecate. Flights of older drones last 32.56±22.49 minutes . Those flights are called mating flights. During those flights drones visit drone congregation areas and attempt to mate with a queen, but only small fraction of them has a chance to mate. Duration of a mating flight is limited by the amount of honey in crop of drone. Weight of drones crop is 17.7±9.1 mg at the time of leaving the nest and 4.3±6.3 mg at the time of returning to the nest . During hours when flights occur drones are more engorged than during other hours of the day . After returning from the flight to the nest drones spend there 17.14±24.42 minutes before going for another flight. During this time drones eat honey and store it in their crop. There can be up to 5 flights during one afternoon  but usually there is 3 or less . Drone flight duration was reported by several authors  for review see . Drones at drone congregation area are less asymmetrical than drones remaining in the colony . This suggests better flight performance of less asymmetrical drones. Flight performance of drones can be affected by Varroa infestation  and inbreeding . During flight drones probably use landmarks for their orientation . Drones often return to a colony other than their own , sometimes they return to a colony in different apiary . In drones oxygen consumption during flight is two-fold higher than in workers . In comparison to workers drones have during flight higher thorax temperature . Force production during tethered flight in drones (3.95±0.23 mN) is higher than in queens and workers . Drone flight is fuelled by highly concentrated nectar (median: 71.6%) transported in both crop and midgut. In the crop there is only about 5 microliters of nectar . During flight drones move their wings 225.0±5.8 times per second  which is slower than in workers (2352±7.5). Burgett D.M. (1974) Drone honey bee flight from clustered swarms. Annals of the Entomological Society of America 67:683–684. Drescher W. (1969) Die Flugaktivität von Drohnen der Rasse Apis mellifica carnica L und Apis mellifera ligustica L. in Abhängigkeit von Lebensalter und Witterung. Z. Bienenforsch. 9:390-409. Ruttner H. (1976) Untersuchungen über die Flugaktivität und das Paarungsverhalten der drohnen. VI. Flug auf und über Höhenrücken. Apidologie 7:331-341. Bol'shakova M.D. (1978) The flight of honey bee drones, Apis mellifera L. (Hymenoptera, Apidae), to the queen in relation to various ecological factors. Entomological Review 56:53-56. Rowell G.A., Taylor O.R., Locke S.J. (1986) Variation in drone mating flight times among commercial honey bee stocks. Apidologie 17:137-158. Ruttner F. (1966) The life and flight activity of drones. Bee World 47:93-100. Koeniger G., Koeniger N., Pechhacker H., Ruttner F., Berg S. (1989) Assortative mating in a mixed population of European honeybees, Apis mellifera ligustica and Apis mellifera carnica. Insectes sociaux 36:129–138. Taber S. (1964) Factors influencing the circadian flight rhythm of drone honey bees. Ann. Entomol. Soc. Amer. 57:769-775. Howell D.E., Usinger R.L. (1933) Observations on the flight and length of life of drone bees. Ann. Entomol. Soc. Amer. 26:239-246. Lavrekhin F.A. (1947) A problem of the biology of drones [in Russian]. Pchelovodstvo 24:57-59. Boucher M., Schneider S.S. (2009) Communication signals used in worker–drone interactions in the honeybee, Apis mellifera. Animal Behaviour 78:247–254. Benstead E. (2009) Genetic composition and phenology of mating drone congregations in the honey bee Apis mellifera. Revue d'Ecologie 64:343–350. Michailov A.S. (1928) On drone flight activity [in Russian]. Opytnaja Paseka 3:209-214. Tuchashvili S.M. (1969) Flight activity of drones of different races [In Russian]. Pchelovodstvo 10:16-17. Verbeek B., Drescher W. (1984) Einfluss von Umweltfaktoren auf die Drohnenflugaktivität. Apidologie 15:277. Lavrekhin F.A. (1960) Comparative observations on the flight activity of drones [In Russian]. Pchelovodstvo 37:43-45. Koeniger N., Wijayagunasekera H.N.P. (1976) Time of drone flight in the three Asiatic honey bee species (Apis cerana, Apis florea, Apis dorsata). J. Apic. Res. 15:67-71. Rinderer T.E., Oldroyd B.P., Wongsiri S., Sylvester H.A., Deguzman L.I., Potichot S., Sheppard W.S., Buchmann S.L. (1993) Time of drone flight in 4 honey-bee species in south-eastern Thailand. Journal of Apicultural Research 32:27–33. Koeniger G., Koeniger N., Tingek S. (1994) Crossfostered drones ofApis cerana (Fabricius, 1793) andApis koschevnikovi (Buttel-Reepen, 1906) fly at their species specific mating times. Insectes Sociaux 41:73–78. 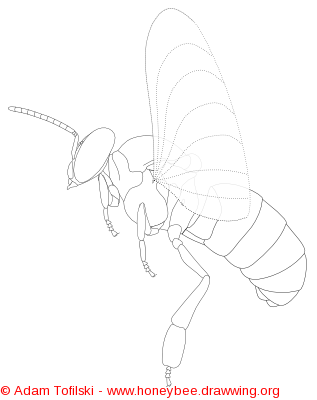 Yoshida T., Saito J., Kajigaya N. (1994) The mating flight times of native Apis cerana japonica Radoszkowski and introduced Apis mellifera L in sympatric conditions. Apidologie 25:353–360. Wilde J., Woyke J., Wilde M. (2003) Competition between drones and between spermatozoa of Apis cerana and Apis mellifera. Asian Bee Journal 5:39-42. Remnant E.J., Koetz A., Tan K., Hinson E., Beekman M., Oldroyd B.P. (2014) Reproductive interference between honey bee species in artificial sympatry. Molecular Ecology (in press). Taylor O.R. (1986) A possible solution to the African bee problem: a proposal to maximize genetic dilution of African bees through the development of a European stock with late-flying drones., Proceedings of the Africanized Honey Bee Symposium, Atlanta, pp. 55–72. Hellmich R.L. (1987) Flight time differences between Africanized and European drones: implications for controlling matings. American Bee Journal 127:846. Hellmich R.L. (1988) Flight time differences between Africanized and European drones., Int. Conf. Apic. Trop. Climates, Cairo, pp. 478-480. Hellmich R.L., Rinderer T.E., Danka R.G., Collins A.M., Boykin D.L. (1991) Flight times of Africanized and European honey bee drones (Hymenoptera: Apidae). Journal of Economic Entomology 84:61–64. Otis G.W., Taylor O.R., Spivak M., Winston M.L., Katz S.J., Kukuk P.F. (1999) Timing of mating flights of Neotropical African and European honey bee queens and drones (Hymenoptera: Apidae) in eastern Venezuela. University of Kansas Museum of Natural History Special Publication 24:103–109. Jordan L.A., Allsopp M.H., Oldroyd B.P., Wossler T.C., Beekman M. (2007) A scientific note on the drone flight time of Apis mellifera capensis and A. m. scutellata. Apidologie 38:436–437. Collet T., Cristino A.S., Quiroga C.F.P., Soares A.E.E., Del Lama M.A. (2009) Genetic structure of drone congregation areas of Africanized honeybees in southern Brazil. Genetics and Molecular Biology 32:857–863. Oldroyd B.P., Reddy M.S., Chapman N.C., Thompson G.J., Beekman M. (2006) Evidence for reproductive isolation between two colour morphs of cavity nesting honey bees (Apis) in south India. Insectes Sociaux 53:428–434. Tofilski A., Kopel J. (1996) The influence of Nosema apis on maturation and flight activity of honey bee drones. Pszczelnicze Zeszyty Naukowe 40:55-60. Rueppell O., Fondrk M.K., Page R.E. (2006) Male maturation response to selection of the pollenhoarding syndrome in honey bees (Apis mellifera L). Animal Behav. 71:227-234. Witherell P.C. (1971) Duration of flight and of interflight time of drone honeybees, Apis mellifera. Ann. Entomol. Soc. Amer. 64:609-612. Free J.B. (1957) The food of adult drone honeybees (Apis mellifera). British Journal of Animal Behaviour 5:7-11. Burgett D.M. (1973) Drone engorgement in honey bee swarms. Annals of the Entomological Society of America 66:1005–1006. Langstroth L.L. (1888) At what age are drone-bees disposed to mate? American Bee Journal 24:55. Kurennoi N.M. (1953) When are drones sexually mature? [in Russian]. Pchelovodstvo 30:28-32. Oertel E. (1956) Observations on the flight of drone honeybees. Ann. Entomol. Soc. Amer. 49:497-500. Jaffé R., Moritz R.F.A. (2010) Mating flights select for symmetry in honeybee drones (Apis mellifera). Naturwissenschaften 97:337-343. Duay P., DeJong D., Engels W. (2002) Decreased flight performance and sperm production in drones of the honey bee (Apis mellifera) slightly infested by Varroa destructor mites during pupal development. Genet. Mol. Res 1:227–232. Moritz R.F.A. (1981) Der Einfluss der Inzucht auf die Fitness der Drohnen von Apis mellifera carnica. Apidologie 12:41-55. Ruttner H., Ruttner F. (1966) Untersuchungen über die Flugaktivität und das Paarungverhalten der Drohnen. 3. Flugweite und Flugrichtung der Drohnen. Z. Bienenforsch. 8:332-354. Galindo-Cardona A., Monmany A.C., Diaz G., Giray T. (2015) A Landscape Analysis to Understand Orientation of Honey Bee (Hymenoptera: Apidae) Drones in Puerto Rico. Environmental Entomology. Currie R.W., Jay S.C. (1991) Drifting behaviour of drone honey bees (Apis mellifera L.) in commercial apiaries. J. Apic. Res 30:61–68. Soland-Reckeweg G. (2006) Genetic differentiation and hybridization in the honeybee (Apis mellifera L.) in Switzerland. PhD thesis, Universität Bern, Bern. Goller F., Esch H.E. (1991) Oxygen consumption and flight muscle activity during heating in workers and drones of Apis mellifera. Journal of Comparative Physiology B: Biochemical, Systemic, and Environmental Physiology 161:61–67. Coelho J.R. (1991) The effect of thorax temperature on force production during tethered flight in honeybee (Apis mellifera) drones, workers, and queens. Physiological Zoology 64:823–835. Hayashi M., Nakamura J., Sasaki K., Harano K. (2016) Honeybee males use highly concentrated nectar as fuel for mating flights. Journal of Insect Physiology 93:50–55. Goyal N.P., Atwal A.S. (1977) Wing beat frequencies of Apis cerana indica and Apis mellifera. Journal of Apicultural Research 16:47-48. Kurennoi N.M. (1956) Flight activity and sexual maturity of drones [in Russian]. Pchelovodstvo 12:24–28. Soczek Z. (1958) Effect of certain factors on mating flights of honey bee queens [in Polish]. Pszczelnicze Zeszyty Naukowe 3:109-120. Lensky Y., Cassier P., Notkin M., Delorme-Joulie C., Levinsohn M. (1985) Pheromonal activity and fine structure of the mandibular glands of honeybee drones (Apis mellifera L.) (Insecta, Hymenoptera, Apidae). J. Insect Physiol. 31:265-276. Rowell G.A., Taylor O.R., Long-Rowell M.A. (1992) Spatial Dynamics of the Honey Bee Mating System (Apis mellifera L.). Journal of the Kansas Entomological Society 65:218–222. Harrison J.F., Taylor O.R., Hall H.G. (2005) The flight physiology of reproductives of Africanized, European, and hybrid honeybees (Apis mellifera). Physiological and Biochemical Zoology: PBZ 78:153-162. Hepburn H.R., Radloff S.E. (1998) Honeybees of Africa. Springer, Berlin.